…a perfect storm of technological, social and political forces has created a society where trust in democracy and in media are at historic lows. …[social media] presents opportunities for political engagement on both the institutional and individual level. But it also makes possible the weaponization of information in ways that promote conflict and confusion. A confluence of economic, social and political circumstances, along with technological advancements, has created a “perfect storm” that is destabilizing citizen trust in media and in other democratic institutions more generally. Exponential advancements in digital technology, coupled with explosive growth in broadband internet and ubiquitous mobile access, have dramatically shifted how news and information are produced, distributed and consumed. The steep decline in advertising revenues for print newspapers over the past two decades has challenged the viability of business models for the traditional news industry. Social media platforms connect users across the world and have expanded their access to information. But they have also provided a means for promoting civil unrest and sectarian violence and have raised concerns about privacy, manipulation and foreign interference. The “public square” has become a 24-hour, continuously connected mobile experience supported by social networks, broadcast and cable television. Navigating the new media environment and separating truth from nontruth will be more challenging as emerging technologies, such as virtual reality, augmented reality, artificial intelligence, bots and deepfakes, become more sophisticated. The media landscape that has emerged over the past several decades has played a role in the diminishing trust in American media. We see it as a perfect storm, driven by rapid and persistent technological change along with the declining business model supporting local journalism and the increased polarization of American politics. Exponential improvements in computing power, the growth of broadband and mobile communications, and, most recently, the rise of social media have reshaped the media landscape and dramatically altered how Americans access and share information. Collectively, these factors have created a challenging new environment that is altering the role of news in a democracy and influencing citizens’ attitudes toward news. The first factor to consider is the speed with which these technologically driven changes have happened. Most technologies evolve gradually after their initial introduction. Railroads, for example, are faster and more efficient now than when they appeared in the mid-19th century. But they still operate today in essentially the same way as when they were first introduced. Much the same is true of other technologies, like automobiles, aircraft and even broadcasting. But this is not true of digital technology. Since the advent of the first electronic computer 70 years ago, digital technology has gone through a series of transformations that has taken it—and its users—on an exponential journey. The development of the integrated circuit, which is at the heart of modern digital technology, gave rise to Moore’s Law (1965). According to that law, the number of elements (transistors) in an integrated circuit doubles every two years, enabling raw computing power to increase at the same rate. This has held true for the past 50 years. As a result, digital computers have steadily become faster, smaller, cheaper and more powerful at an exponential rate. Uses that seemed like science fiction at one point have become ordinary reality a few years later. For example, each of the smartphones that millions of people now carry has more computing power than the most advanced supercomputers of just a few decades ago. In the early 2000s, a set of technologies came together into platforms, social networks and software that made connectivity and solving complex problems fast, virtually free, easy for you, ubiquitous and invisible. Suddenly, more individuals could compete, connect, collaborate and create with more other people, in more ways, from more places, for less money and with greater ease than ever before. Even in the relatively early days of the internet’s growth, however, a number of problems became apparent. For example, since setting up a decent website required few resources and creators can be anonymous, it was challenging for users to differentiate between established, credible institutions and more dubious sources online. It was also difficult to figure out where web content was coming from or who was creating it, which offered opportunities for bad actors to provide fake or misleading content. Viruses appeared that could spread rapidly through the internet and infect millions of computers. Security breaches that compromised personal information happened with increasing frequency. Spam began to clog users’ mailboxes. Multiple industries were disrupted as the creation and distribution of content shifted from physical to digital form. Still, the internet grew rapidly. While relatively few Americans used it in the early 1990s, more than half were on by 2000, and by 2017 more than 90 percent of Americans were. Two important drivers of this growth have been broadband networks and mobile communications. Beginning in the late 1990s, broadband access became a reality for many users. All-digital broadband connections were not only faster than previous “narrowband” connections, but they were “always on” and did not require a time-consuming logon process. In less than a decade, broadband was the dominant means by which Americans connected to the internet. Thanks to broadband, the psychological distance between users and cyberspace shrank substantially. As it got easier, people went online more frequently, did more while online and stayed longer. Sharing rich media like music, photos and video became common. YouTube launched in 2005, and by the end of the year, it was generating 8 million video views a day. In 2007 Netflix, which had started by distributing movies on DVDs through the mail, introduced a broadband streaming service. It then rapidly shifted from being the fastest-growing customer of the U.S. Postal Service to being one of the largest generators of internet traffic. The next big revolution was the move to wireless connections. Cellphones initially appeared in the mid-1980s, and for two decades they remained just portable telephones. That changed in 2007 with the introduction of Apple’s iPhone, the first true “smartphone” that was as much a miniature computer as mobile phone, and could support a wide variety of uses. Notably, the instrument included a web browser designed for the iPhone’s small screen, which enabled mobile access to the entire web. Just as wired computer networks evolved from narrowband to broadband, so wireless networks steadily improved their performance. With each new generation of wireless technology, cellular carriers upgraded the speed and reach of their networks, while fast (and often free) Wi-Fi access became increasingly pervasive. Due to the prevalence of smartphones and other connected devices, it has increasingly become a “mobile first” world. In 2008, Americans spent 80 percent of their online time on laptops or desktops. Just eight years later, more than half of their online time had moved to mobile devices. A 2018 Pew study highlights the importance of smartphones to usage levels: 31 percent of smartphone users are “online almost constantly,” compared with just 5 percent of nonusers. Among U.S. teens and young adults, 95 percent have a smartphone, and 45 percent say they are online almost constantly. Thanks to the popularity of wireless broadband and smartphones, cyberspace has become a pervasive digital environment that accompanies people wherever they go. Checking, sharing and commenting on news can now be done throughout the day. Podcasting has provided a new way for people to listen to the news. Voice-activated devices distribute content. Within a few years, the next generation of mobile technology (5G) promises to provide even faster, more pervasive wireless connections, not just among humans but for the Internet of Things (linking devices such as webcams, alarms, sensors and even autonomous vehicles) as well. The most recent chapter in the evolution of the internet has been the shift from a focus on providing access to information and transactions to connecting people to one another through social networks. Communication functions like email, bulletin boards, texting and chat have long been popular. But the rise of social media networks vastly increased the person-to-person function of the internet and inspired people to share the most intimate aspects of their lives, often in real time. Social media provided a new kind of platform that allowed individuals and groups that had not previously had a voice to express themselves and reach others with similar interests. It has also provided new channels for the dissemination of both information and disinformation, renewed connections and bullying, political fundraising and intentional misrepresentations. The most dramatic example of this shift is the spectacular rise of Facebook. After it was founded in 2004, it took Facebook four years to reach its first 100 million users. In the next four years, Facebook grew to 1 billion users and since then has topped 2 billion users (see Figure 3.1). Facebook is now truly global. Although it started in the United States, only about 10 percent of its current user base (214 million people) comprises Americans. For many people around the world, Facebook is the internet. Though not as massive as Facebook, other, newer social networks are still impressively large: YouTube, owned by Google’s parent, Alphabet, has nearly 2 billion users. Twitter, started in 2006, has 335 million monthly users and over 100 million daily users. WhatsApp, founded in 2009 and now owned by Facebook, has 1.5 billion users, and Instagram, launched in 2010 and also owned by Facebook, has 1 billion users worldwide. Snapchat, started in 2011, has 291 million monthly users. 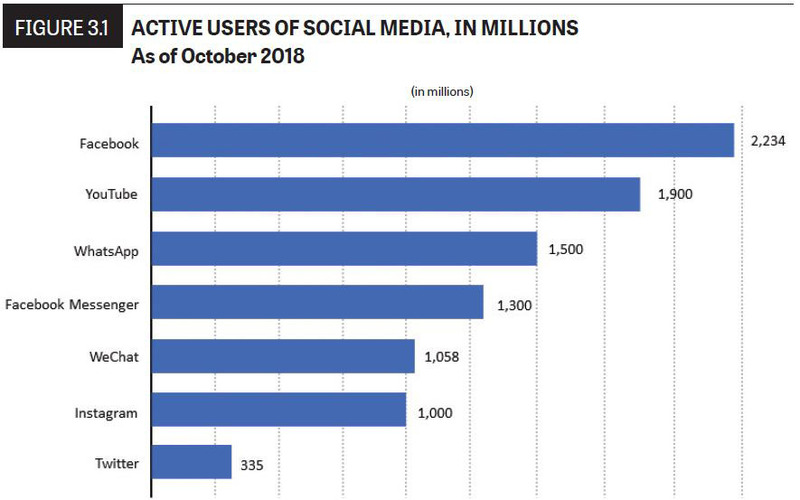 Not all popular social networks are U.S. based: Tencent’s WeChat, a Chinese-language social network, had more than 1 billion monthly active users as of mid-2018. With the proliferation of smartphones, it is possible to stay almost continuously connected to social networks—and many people do. More than a billion users log on to Facebook from a mobile device daily, and often multiple times a day. And services like Instagram, WhatsApp and Snapchat are designed as exclusively mobile applications. Amid this impressive growth, young people’s use of social media is undergoing a significant shift. For American teens, Facebook is no longer as dominant, with the percentage of teens who say they use Facebook dropping from 71 percent in 2015 to 51 percent in 2018, lower than the shares who use Instagram, YouTube or Snapchat. Social networks have connected people in new ways. They enabled countless families and friends to stay in touch even while they are geographically separated. They are used for pro-social campaigns, such as encouraging people to become organ donors or young people to register to vote. Activists use them to raise awareness of social injustices. And citizens of repressive regimes have organized protests online, which have led even to the fall of governments. Few people, even including some early investors in social media companies, anticipated how these tools would be used for anti-social purposes. Yet we have seen in recent years online bullying, manipulation of public opinion with impersonation and false information, and the encouragement of sectarian violence. A powerful force shaping these global social networks is the business model that determines how they operate. Since these services are free to use, they depend on advertisers for revenue. As Silicon Valley entrepreneur Gina Bianchini explained to the Commission, in the mid-2000s “social networks became social media.” In so doing, they moved from a focus on connecting users to one another to monetizing their users with targeted advertising tools. Because operators sell audiences to advertisers, they have a strong incentive to attract as many users as possible and to maximize the amount of time they spend on their sites. Because these sites are digital, they routinely capture large amounts of detailed data on the interests and behavior of their users. With this data, operators are able to fine-tune the algorithms that determine what users see, in order to maximize their appeal. The extensive information that they gather on users allows advertisers to reach those most likely to be interested in their products. Researchers and observers have explored the way in which designers of these entities deliberately work to make them as addictive as possible to keep users coming back.iii Others, referring to the popularity of extreme content online, point out that “polarization may be bad for democracy, but is a great business model.” But the same has also been said about cable television news, partisan digital sites and broadcast media. Scale. A majority of the 7 billion people in the world now have access to the internet, most of them via mobile devices. Social media platforms have grown to reach vast numbers of users, challenging our ability to fully grasp their impact. Facebook now has more than 2 billion users. Twitter, operating in 40 languages and producing hundreds of millions of tweets every day, and YouTube, with users in 88 countries watching 4 billion videos daily and uploading 60 hours of new video each minute, have attained similar size and complexity. Instantaneity. In this hyperconnected environment, messages can travel quickly and virally throughout the world, which makes correction of falsity all the harder. The adage that “a lie gets halfway around the world before truth puts on its boots” seems truer today than ever. Multiplicity of voices. The many-to-many nature of social media that allows voices and opinions from anywhere and anyone has vastly expanded sources of information, for good or for ill. Everyone connected to the internet has, at least in theory, the ability to act as a producer as well as a consumer of content, and social media platforms are designed specifically to encourage and facilitate free expression. This has become an asset, especially to those who did not participate or were not heard previously. But this openness also increases the potential for the distribution of misinformation or disinformation, which has occurred in significant measure over the past few years. Anonymity. The ability to post anonymously has created an environment in which users do not easily know the source of information to which they are exposed. Hiding behind a screen of anonymity can protect the identity of dissidents but permits users to be less accountable for what they communicate. Furthermore, this is now a world where it is increasingly difficult to tell humans from artificial bots (see “Emerging Technologies”). Insecurity. When it was first conceived, the internet was intended only to link a relatively small number of users who knew and trusted one another. As it grew to global scale, the failure to build in security mechanisms has created vulnerabilities, subjecting users to repeated breaches that have compromised the personal information of tens of millions of users. And given the fundamental design of the internet, no easy fixes are apparent, even as the pace and scale of attacks continue to grow. Cybersecurity, then, is a continual arms race where hackers and preventive measures each advance in reaction to the other. Attention scarcity. In an environment rich in information, attention becomes scarce and valuable. In the face of the increasingly vast amount of information that an individual confronts every day, voices need to shout or be extreme to attract attention. A business model that is based on maximizing advertising revenues by maximizing the number of users encourages emotionally charged content, whether true or false. This can encourage sensationalism at the expense of the truth. Filter bubbles and echo chambers. One of the most effective and commercially successful techniques employed by data-driven, targeted advertising tools is personalization. This is a technique designed to promote content that appeals to “people like you.” One result of this technique is to provide users with content that reinforces their pre-existing views while isolating them from alternative views, contributing to political polarization and a fragmentation of the body politic. In turn, increasing political polarization encourages people to remain isolated in ever-more-separate ideological silos, offline as well as online. The amplification (i.e., the widespread sharing) of ideas through various media is now a major activity within the information and media ecosystem. Ideas or memes can go viral instantly, for good or for harm. Furthermore, concentration of control of platforms by a relatively few companies raises potential problems, temptations and solutions. Gaining access to the platform allows one to reach incredible numbers of people almost instantly. Intervention by the platform can ban someone from this significant medium, but failure to intervene can allow harmful messages to spread unchecked. This ongoing process presents opportunities for political engagement on both the institutional and individual level. But it also makes possible the weaponization of information in ways that promote conflict and confusion. Thus, a perfect storm of technological, social and political forces has created a society where trust in democracy and in media are at historic lows. The next chapter lists specific reasons that may explain this loss of trust. i Although Apple has sold tens of millions of iPhones, Google’s Android operating system now holds a dominant 87 percent share of the smartphone market. Statista, “Global Mobile OS Market Share in Sales to End Users from 1st Quarter 2009 to 2nd Quarter 2017,” https://www.statista.com/statistics/266136/global-marketshare-held-by-smartphone-operating-systems. iii See, for example, Adam Alter, Irresistible: The Rise of Addictive Technology and the Business of Keeping Us Hooked (New York: Penguin Press, 2017). iv See, for example, Siva Vaidhyanthan, Anti-Social Media (Oxford University Press 2018) and Adam Alter, Irresistable (Penguin Press 2017).